Interestingly, the word “Toronto” is the native Huron word for “place of meeting.” It is fitting then that the Greater Toronto Area (GTA) is home to over 5 million people and more than half of those residents were born outside of Canada. This rich diversity makes the GTA one of the most multicultural areas in the world. It also makes it an exciting place to work and live. With this many people from so many different places living in the same city, it is not surprising that different parts of the city have developed different characters. There is much that is comforting about the culture in which people were raised thus certain people groups have tended to gravitate to the same areas of the city. Where people congregate, services have develop to meet their needs. Thus, particular neighbourhoods have community centres, stores, restaurants and places of worship that reflect the people living in them. Attention to these specific neighbourhoods is valuable both for those new to Canada and to anyone who wants to understand the GTA. The Greater Toronto Area (GTA) has a population of 5,555,912 (2006 Census). It includes the city of Toronto and four regional municipalities. It is a total land area of 7125 km (2751 miles). 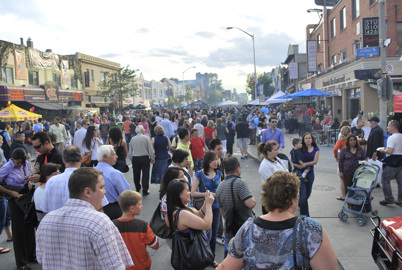 The city of Toronto has a population of 2.48 million, 45% of GTAs. The city of Toronto has 52.4 % of all GTA immigrants. For more information about the Diverse population in the GTA visit the Diversity page or the Toronto Social Atlas page on the City of Toronto’s website. 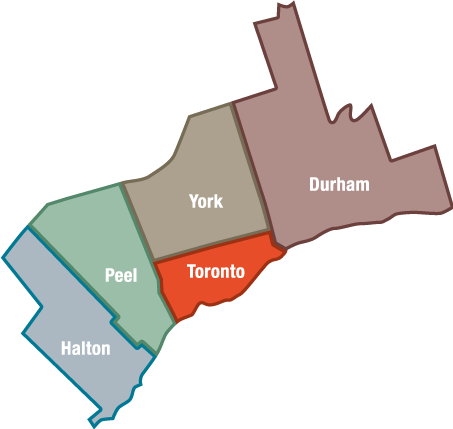 To be more specific, the GTA is divided into 5 regions – Click on one of the regions to find more resources for each of the communities of that region.